The September 7 ACM webinar on "Embracing Open Data Science in Your Organization" by Christine Doig of Continuum Analytics is now available for replay. The talk lasts an hour (skip the first 3 minutes). Alternately, the slide deck (no audio) is located here. The talk is focused on the Anaconda distribution, a set of 150+ Python packages for data science published by Continuum. The initiative also includes a cloud service to host and share public (free) and private data science assets. Two weeks ago, the New York Times published an article entitled "U.S. Tech Giants Are Investing Billions to Keep Data in Europe." The article focuses on efforts by Amazon, Google and Microsoft to avoid restrictions placed on them by the European Union's General Data Protection Regulation (GDPR) by hosting the data pertaining to European citizens within Europe. There are several ironical twists to this trend. First, when the draft of the GDPR was leaked in June 2015, some of the same companies screamed that "this means the end of the cloud in Europe." But instead, it simply means that they have had to establish local data centers and pay more attention to data residency -- certainly at a cost compared to hosting everything in one place, but hardly a business-killing situation. Secondly, one might have thought that the new regulations would place US companies at a disadvantage in Europe, and would foster the emergence of Europe-based cloud providers. But between the U.S. providers' experience and lead in this domain, and perhaps a lack of understanding or ability to respond to change on the Europeans' side, no viable local competitors emerged during the window of opportunity they had. In the end, it looks like the U.S. cloud giants will have snatched victory from the jaws of defeat and will be doing just fine with European customers, thank you very much. Another irony of course is that the U.K. used to be very well positioned as a beachhead into Europe for U.S. companies, but the Brexit decision may ultimately mean that the country will cease to be an acceptable place to provide cloud services to EU countries. The Cloud Standards Customer Council webinar on Cloud Customer Architecture for e-Commerce, given on October 4, is now available for replay. The presentation gives a good "guided tour" of all the capabilities that an e-commerce system must include, as well as lists of potential cloud components that can be used to compose a complete e-commerce system. Tomorrow, Oct. 18 at 11:00 Eastern US time (16:00 UK, 17:00 Europe), Ron Townsen of General Dynamics and Andrew Watson of the Object Management Group will present a webinar on "Cyber Security Protection for Front Line Real-Time Systems." They will explain the scope of the OMG's Request for Information (RFI) on what new or improved standards can reduce cost in developing high-quality cybersecurity solutions, and invite the audience to respond. Register here. In the previous issue, we mentioned an act of "cyber-retaliation" perpetrated against a reporter, Brian Krebs, who had exposed cybercriminals. A few days later, security expert Bruce Schneier commented on this incident in this Motherboard blog article. Schneier's analysis leads him to attack the current state of the Internet of Things, because the distributed denial-of-service (DDoS) attack against Krebs was issued by a large number of distributed devices such as CCTV cameras, DVRs, home routers and other systems that didn't used to be enlisted in such attacks. While Schneier is a well-regarded authority, his claim that things will not get better unless the government steps in through regulations will sound worrisome to some, especially at a time when we suspect that certain cyberattacks are precisely orchestrated by governments. We ought to be careful about what we ask for. Schneier himself acknowledges at the end that only making the protocols more resilient will ultimately work because "a domestic solution to an international problem" is not sufficient. "It's time to move on from 'What is the IoT?' discussion if you want to secure it." "On this date [October 15] 60 years ago, FORTRAN -- the world's first modern computer language -- was released." 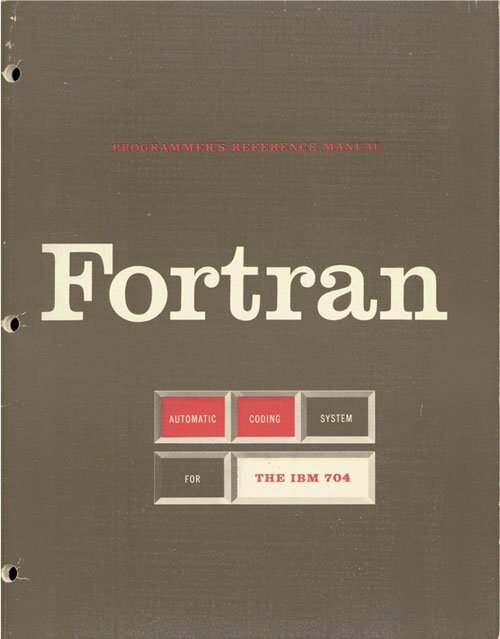 entitled "Fortran - Automatic Coding System for the IBM 704"